Real absinthe. No artificial ingredients, no gimmicks. The first legal American absinthe released after the U.S. ban was lifted in 2007, St. George Absinthe Verte remains one of the most acclaimed and respected spirits in this category. Made from a host of real botanical ingredients, ours is a layered and evocative expression of this beguiling and highly spirituous herbal elixir. And it has a monkey on the label! 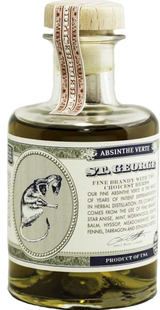 Sipped neat, St. George Absinthe Verte is a heady, herbaceous smack to the senses. It opens with spicy black licorice and then slowly evolves into citrus and grass profiles with a dose of sarsaparilla. Because of the abundance of essential oils, it's rich and viscous on the palate-even at 120 proof (60% alcohol). To bring out another level of vivid flavors and a lovely louche (milky cloudiness) that seems to glow from within, a single large ice cube is ideal. Adding water further releases botanical oils into solution, deepening the louche and intensifying the heady, floral aroma.